Across the three former Soviet nations surveyed in 2011, there is a widespread view that ordinary citizens have reaped few rewards from the political and economic changes of the past 20 years. 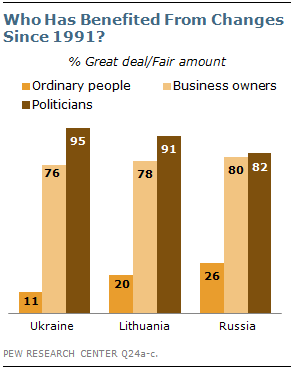 Indeed, clear majorities in Lithuania, Russia and Ukraine agree that average citizens have benefited “not too much” or “not at all.” By contrast, three-quarters or more in each country say business owners and politicians have gained a “great deal” or “fair amount” over the past two decades. Beyond the impact on specific groups, the prevailing view across all three countries is that the changes since 1991 have had a more negative than positive influence on society. When asked about the impact of political and economic changes on a range of issues – including national pride, ethnic relations and social values, fewer than half in each country say the changes have had a good influence in any area. In fact, majorities in all three countries say the changes since 1991 have had a deleterious effect on such things as living standards, public morality, how much people care about others, and law and order. Lithuanians today are considerably less enthusiastic about the impact of political and economic change compared with 1991, when publics in the three nations were first asked about the dramatic transformations under way in their countries. However, criticism in Lithuania tends to be less harsh than in Ukraine or Russia, where negative assessments concerning two decades of change are both more pervasive and more intense. In each of the countries surveyed, most believe ordinary citizens have benefited little, if at all, from the political and economic changes ushered in by the demise of the Soviet Union. Only about a quarter of Russians (26%) say average citizens have gained from two decades of change, while even fewer Lithuanians (20%) and Ukrainians (11%) agree. Across the three nations, roughly seven-in-ten or more say ordinary citizens have benefited not too much or not at all. In sharp contrast, publics in each of the three countries are widely convinced that people who own businesses have benefited a fair amount or a great deal from the political and economic changes of the past two decades. Super-majorities in Russia (80%), Lithuania (78%) and Ukraine (76%) all hold this view. Overwhelming numbers in each nation also believe politicians have gained from the changes since 1991. More than nine-in-ten Ukrainians (95%) and Lithuanians (91%) feel this is the case, while slightly fewer Russians (82%) think politicians have benefited from the changes. Russian and Ukrainian assessments about who has gained the most from two decades of political and economic change have shifted only slightly since a fall 2009 Pew Global Attitudes survey first asked the same questions. Publics in five other former communist-bloc countries – Bulgaria, the Czech Republic, Hungary, Poland and Slovakia – were also asked in the 2009 survey about who had gained from the political and economic changes in their countries.2 Clear majorities in all five nations agreed that politicians and business owners had benefited from the changes. Only in the Czech Republic did more than half (53%) say the same about ordinary people. Elsewhere, the majority view was that average citizens had generally not benefited from the changes. Given that most people in Lithuania, Russia and Ukraine believe the revolutionary changes set in motion twenty years ago have done little to improve the lives of ordinary citizens, it is not surprising that across a range of measures – from standard of living to law and order to family values to ethnic relations – the prevailing view is that the developments of the past two decades have done more harm than good in terms of personal and social well-being. While disenchantment is evident in all three countries, Ukrainians and Russians tend to be more negative about the impact of political and economic change than Lithuanians. That said, compared with 1991, Ukrainian and Russian reactions to change have softened somewhat, while Lithuanians have grown generally more critical. Ukrainians offer some of the harshest assessments of how two decades of change have impacted society. Roughly eight-in-ten, for instance, believe the political and economic transformations since 1991 have had a bad or very bad influence on the standard of living (82%), how much people care about others (82%) and law and order (79%). About two-thirds or more also point to negative impacts in terms of public morality (72%) and how hard people work (66%). Roughly half of Ukrainians are critical of how the changes since 1991 have affected family values (53%) and spiritual values (49%). In the case of the former, only about a fifth (21%) believe the political and economic changes have had a positive effect on family values, while slightly more (31%) say spiritual values have improved. When it comes to how different ethnic groups get along with one another, just over a third of Ukrainians (36%) believe two decades of change have hurt inter-ethnic relations. By comparison, about a quarter say political and economic changes have had either no influence (25%) or a positive influence (23%) on relations between ethnic groups. 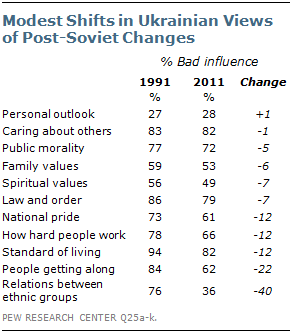 Ukrainians are divided as to what the changes since 1991 have meant for their own outlook on life. About three-in-ten (28%) say the impact on how they think about things has been negative, while nearly the same percentage say the effect has been either non-existent (29%) or positive (28%). Compared with twenty years ago, Ukrainian criticism of political and economic change has tended to soften. The largest shift has occurred with respect to inter-ethnic relations. Two decades ago, roughly three-quarters of Ukrainians (76%) thought the changes underway were having a bad influence on relations between ethnic groups; today, the number who hold this view is down 40 percentage points. Meanwhile, the proportion of Ukrainians who think political and economic changes are adversely affecting how people get along with one another has dropped 22 percentage points. On other measures, Ukrainian opinion has shifted less dramatically. For example, the percentage of Ukrainians saying the political and economic transformations in their country have had a deleterious effect on how hard people work, living standards and national pride has declined 12 percentage points in each case since 1991. There have also been slight declines in the number of Ukrainians who believe political and economic changes have had a bad influence on spiritual values (-7 percentage points), law and order (-7 points), family values (-6 points) and public morality (-5 points). Although not as harsh as Ukrainians in judging particular societal impacts, Russians are nonetheless broadly critical of how twenty years of political and economic changes have affected their country. In fact, in all but one of the 11 areas measured by the survey, majorities in Russia say the changes have had a negative influence. This includes six-in-ten or more who believe that the past twenty years have brought deterioration in public morality (68%), the degree to which people care about others (65%), how well people get along with one another (63%), law and order (61%), standard of living (61%) and relations between ethnic groups (60%). Smaller majorities in Russia believe the political and economic changes have adversely affected family values (57%), national pride (56%), spiritual values (53%) and how hard people work (52%). Similar to Ukrainians, the one area where Russians are less certain about the impact of the past two decades is personal outlook. Three-in-ten say the changes since 1991 have had a bad influence on how they think about things, compared with the same percentage who say the changes have had a good influence. A fifth (20%) say the changes have not impacted their personal outlook. In 1991, Russians tended to be even more critical of the political and economic transformations under way in their country. Since then, negative reactions have generally eased. The most dramatic shift in Russian views has occurred with respect to living standards. In 1991, fully nine-in-ten stated that political and economic changes were undercutting living standards; today, the percentage holding this view is 29 percentage points lower. Russian criticism has also softened on other measures of social and personal well-being. 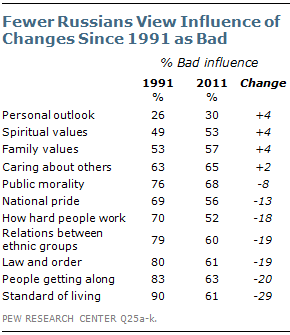 For instance, over the past twenty years, there has been a sizable drop in the number of Russians who believe the changes have had a negative impact on how well people get along with one another (-20 percentage points), law and order (-19 points), inter-ethnic relations (-19 points) and how hard people work (-18 points). Smaller shifts have occurred with respect to the percentage of Russians who see negative consequences for national pride (-13 percentage points) and public morality (-8 points). Areas in which public opinion has remained basically unchanged compared with 20 years ago include personal outlook, family and spiritual values and how much people care about one another. Like their post-Soviet counterparts, Lithuanians are critical of how the political and economic changes of the past twenty years have affected social and personal well-being in their country. As in Russia and Ukraine, majorities say the changes have had a negative influence on how much people care about others (60%), standard of living (56%), law and order (55%) and public morality (55%). Roughly half also point to negative consequences for family values (50%) and how people get along with one another (48%). And more, on balance, believe the changes since 1991 have had a negative rather than positive influence on relations among people who live in their country (45% vs. 27%) and spiritual values (40% vs. 33%). Unlike Ukrainians and Russians, however, Lithuanians allow that the past two decades have actually done more good than harm in a few areas. About half (49%), for instance, say that the political and economic changes have had a positive impact on national pride, compared with 30% who disagree. In addition, more say the last twenty years have had a good (39%) rather than bad (28%) influence on their personal outlook, and just over a third (36%) think that the changes since 1991 have positively influenced how hard people work, compared with 30% who hold the opposite view. Twenty years ago, positive assessments of change were much more common in Lithuania. Indeed, since 1991, negative reactions have intensified on a number of fronts. Some of the biggest shifts in public opinion have occurred with respect to family and spiritual values, as well as national pride. Two decades ago, just 23% of Lithuanians thought the political and economic changes were having a bad influence on family values; today, 50% hold that view. Meanwhile, opinion about the impact on spiritual values has moved in the same direction, with the percentage of Lithuanians seeing a negative impact increasing 24 percentage points between 1991 and 2011. Similarly, the proportion saying the changes have had a negative influence on national pride has risen 23 percentage points between 1991 and 2011. Compared with twenty years ago, Lithuanians are also now more inclined to believe that political and economic changes have had a bad influence on how much people care about others (+19 percentage points) and public morality (+18 percentage points). More modest increases have occurred with respect to the number of Lithuanians who see negative consequences for how well people get along with one another and personal outlook (+8 and +5 percentage points, respectively). Yet, there are exceptions to this pattern. On several measures, fewer, not more Lithuanians are downbeat about the impact of political and economic change. For example, the number worried that the political and economic changes have had a negative influence on the standard of living has declined 31 percentage points. Concerns about the impact of changes on relations between people have also eased, with the number seeing negative consequences falling 12 percentage points. In addition, the proportion of Lithuanians who believe the political and economic changes have adversely affected how hard people work or harmed law and order has declined slightly (-7 percentage points in each case).